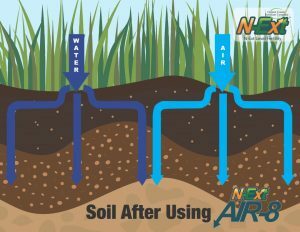 N-Ext Air-8 0-0-5 Liquid Aeration is designed to break up and loosen topsoil and encourage deeper rooting to drive more oxygen into the topsoil profile. By utilizing key bio-stimulants and highly oxidizing material at key growth stages. Liquid aeration creates fractures within the soil allowing for deeper penetration of water; roots will in turn follow, making nutrients available that were previously unreachable by the plant. Liquid aeration can be done anytime during the growing season. Liquid aeration covers the entire lawn. There is no need to mark sprinkler heads, invisible fences or cable lines. The goal of aerating a lawn is to get more oxygen, water and nutrients into the root zone. Improving the aeration within the soil is especially beneficial to lawns that are growing in clay or compacted soils. Contact us Today for your Liquid Aeration Estimate.